RIO DE JANEIRO (AP) — Two of South America's biggest football rivals could finally play for the continent's biggest club prize. With nine titles between them, Argentine giants Boca Juniors and River Plate have to get past only two Brazilian clubs to meet in the final for the first time in 58 years of the Copa Libertadores. 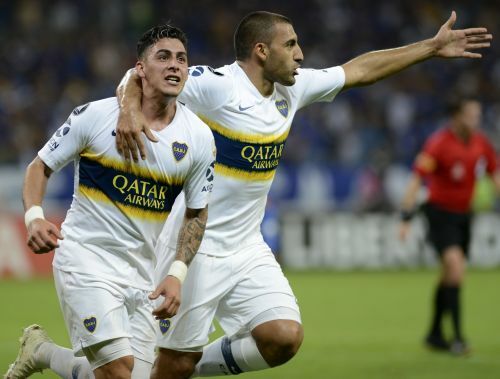 Inspired by 22-year-old sensation Cristian Pavon, six-time champion Boca has already ousted a Brazilian team — Cruzeiro — to reach the semifinals. Striker Ignacio Scocco helped River Plate advance past local rival Independiente. When River and Boca met in the round of 16 in 2015, the second leg ended in controversy in La Bombonera. Boca fans targeted rival players with pepper spray, the game was stopped, and River was awarded the victory. "Let's take it easy," River chairman Rodolfo D'Onofrio. "Both of us have very tough adversaries." Three-time champion River has a semifinal against Gremio, the defending champion which advanced by routing Argentine side Atletico Tucuman 6-0 on aggregate. Six-time champion Boca takes on Palmeiras, which is led by 2002 World Cup-winning Brazil coach Luis Felipe Scolari. Palmeiras hasn't reached the Copa Libertadores final since winning in 1999 when Scolari was also in charge. The first leg of the semifinals will be over Oct. 23-25. The second legs are on Oct. 30 and Nov. 1. South America's second most prestigious cup is at the quarterfinal stage, featuring three teams each from Brazil and Colombia. Bahia and Atletico Paranense meet in an all-Brazilian encounter. The winners will take on Fluminense of Brazil or Nacional, the Uruguayan side which surprisingly eliminated title favorite San Lorenzo. There's an all-Colombian matchup between Santa Fe and Deportivo Cali. The winner could face a Colombian side if Junior Barranquilla beats Defensa y Justicia. The winner of Copa Sudamericana secures a spot in the next Copa Libertadores. The heir to Luis Suarez and Edinson Cavani might be emerging in Uruguay. Gabriel Fernandez has retained his player of the month award in Uruguay after scoring a league-leading nine goals for Penarol. The 24-year-old striker, who is nicknamed "Toro," scored three goals in the last four matches of September. Watch out for him soon in the Uruguay national team. Brazil is getting in on the soccer streaming revolution. The rights to broadcast games from the national championship from 2019 to 2022 have been sold for $150 million to live streaming platform Fanfoot. The contract was signed with company BRFOOT Midia and the values will be equally split among 18 clubs. TV Globo, Brazil's most poweful media group, owns broadcasting rights of the country's national championships.